The 18-meter tower uses solar radiation to draw polluted air into a filtration system. China has long suffered from some of the worst smog in the world. Now, the government wants to do something about it. Alongside other attempts to clean up the environment, authorities have spent $2 million on a prototype filtration system that could help address the issue. 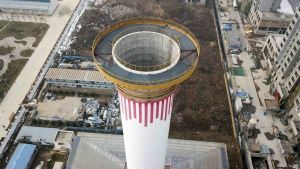 The 18.2-meter (60-foot) chimney, constructed in the city of Xian, uses sunlight to filter out noxious particles and emit clean air. The chimney sits above a large open structure. The roof’s glass pane is heated up by solar radiation, which warms up the air and causes it to rise toward the base of the tower. From there, the air is carried through several industrial filters, before being released through the top of the chimney. Project lead Cao Junji carried out the first tests of the structure back in January 2018, as pollution peaks during the winter months. Equipment capable of measuring the presence of particulate matter under 2.5 micrometers in diameter was placed at the tower, and ten further stations across an area of 10 square kilometers (3.8 miles). These results have not yet been published, and have not undergone peer review, but preliminary reports determined the chimney emitted between 5 and 8 million cubic meters of filtered air every day. Nearby monitors recorded 19 percent less particulate matter compared to other parts of the city. There are still lingering doubts about the economics of the project. Cao suggests that arrays of around half a dozen towers might be necessary to tackle the smog in urban centers, which could be prohibitively expensive. According to a report from Nature, Cao also claims the running costs for the pilot program would amount to $30,000 per year. Neil Donahue, a professor of chemical engineering, chemistry, and engineering and public policy at Carnegie Mellon University, told Nature that there are a lot of unanswered questions to answer regarding the project’s capacity to filter out precursors to particulate matter like sulfur dioxide gas. Beyond that, the larger looming question is whether the environmental impact of building these structures would outweigh their benefits. If not, it may be that the power and other resources being used for the filtration system could be better used elsewhere.